Why Do Heat Pumps Pump Energy so Easily? I know my posts are usually walls of text, but I am trying to improve! In his landmark physics course, the Feynman Lectures on Physics, Richard Feynman tries to explain what an explanation in physics actually is. You can always understand “the math” and follow a proof step-by-step. Nevertheless, this does not necessarily mean that you have really grasped the clues. Real deep, but yet intuitive understanding becomes harder and harder the more abstract the concepts become. Feynman claims that physicists do not really understand on a fundamental level what cannot be explained to freshman students. He himself has invented ingenious twists and lines of reasoning in order to explain seemingly old and dull physics. I can only second that. Trying to find those brief, intuitive but exact explanations is an obsession of mine, and I plan to report on my attempts as a would-be-Feynman in my blog. I start with an arbitrary question: A heat pump is often said to work like a refrigerator, but “just the other way round”. I do not like this explanation too much, as “the other way round” is misleading (actually a heat pump is in some sense also a steam power plant, just working “the other way round”) and it does above all not explain how a refrigerator works. 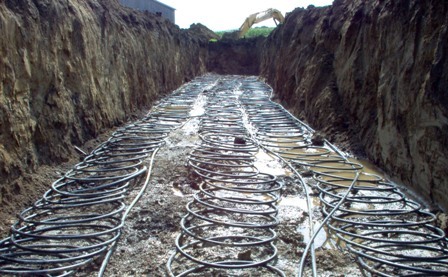 Heat pumps sort of enhance the energy retrieved from the “cold” ambient environment, typically you gain about 4 times as much heating energy – available to you internal heating devices – as you put in electric energy. A super optimized machine would be able to enhance energy by about a factor of 8. Where does this come from? Is this sort of a perpetuum mobile? No, this is actually due to a fundamental natural constant: The marvellous enhancement factor is due to the fact that also the so-called cold environment is still rather hot compared to the absolute zero temperature of -273,15°C. There is some amount of internal energy connected to virtually anything and this energy reaches a zero point when all of this energy has been extracted. If we would try to multiply heat from a cold asteroid in outer space – an asteroid without an atmosphere and far away from shining stars, with a temperature near the temperature of cold space, about 3K – then the multiplication factor is very close to 1. In winter (on earth) the heat pump transfers heat from hot 273K (0°C) to a little bit more hot 298K (25°C). If the heat pump would operate on the surface of the sun (5000K) and increase the temperature to 5020K, the multiplication factor would be 251! As a sidenote a perfectly operating heat pump could be used to explain what temperature actually is or better: why it is just natural to measure the temperature in Kelvin. The limit of -273,15°C has originally been discovered on studying the thermal expansion of gases (extrapolating backwards to low temperatures). But you can start the line of reasoning from describing a perfectly operating heat pump – and you would define the temperature scale as natural that puts an end to the multiplication capabilities of the heat pump. Now the question is: Why is there a limited amount of internal energy? Haven’t we learned that energy is something that makes only sense if measured in relation to another “state” anyway (such as measuring a change in gravitational energy)? It seems I have again failed to keep my post short anyway, so I will leave this question to a future post! This entry was posted in Heat Pump, Physics, punktwissen, Science and Technology and tagged Energy, Heat Pump, Physics in a Nutshell, Refrigerator, Science, Thermodynamics by elkement. Bookmark the permalink.